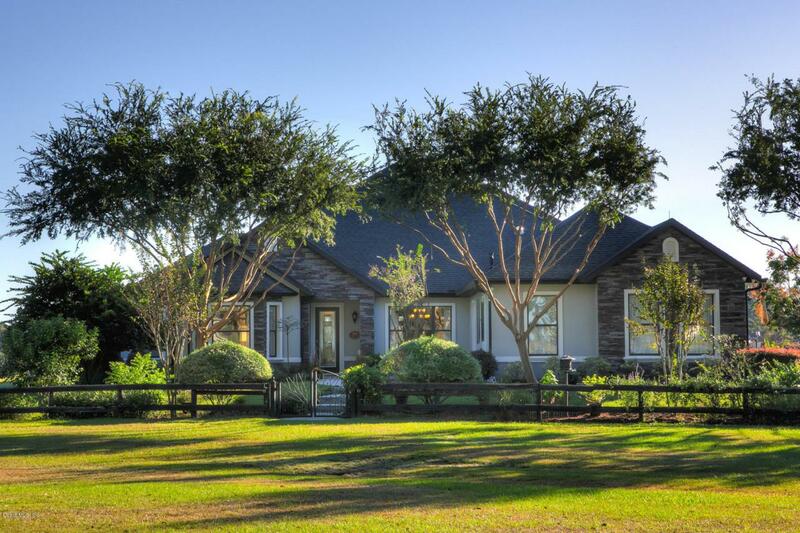 This meticulously maintained 10+ acre farm is the perfect size for manageability! The stunning custom home features easily-maintainable beautiful tile floors throughout, tray ceilings, can lighting, spectacular eat-in island kitchen with granite and stainless counters, stainless appliances, and gorgeous stone accents. The home features tons of large windows flooding it with natural light. The huge master includes en suite bath with granite counters, and spectacular Roman shower. There are sliders from the living, dining, and master to the breathtaking pool and outdoor living area that includes stone accents echoed throughout the home; it features a chlorine-free, solar heated pool, several sitting/dining areas, and a summer kitchen, but in Florida you'll surely be usingthis area year-round. There is no shortage of great spots to build your barn and add any other amenities of your choosing. If you are yearning for some sunshine, and the real Florida lifestyle, you will find it here.